You may already know Polar Shades manufactures superior window shades and is one of the country’s premier suppliers of exterior and interior retractable shades. 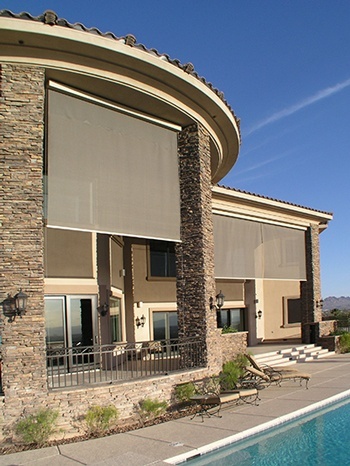 Or that we’re a family owned business with the largest inventory of roller shade fabrics in Nevada. But there’s so much more we’d like to share. 1. Installing our retractable shades can help reduce your energy costs by up to 30%. The American Society of Heating & Air Conditioning Engineers conducted a study that found about 20% of your air conditioning load is caused by the solar radiation that comes through your home’s windows. Shades can significantly reduce solar heat gain from direct sunlight, up to 77%. When you consider peak utility rates are often the highest, this represents a lot of savings. The study also found shades are more effective than tinted glass or window film. They’re also better than blinds, which were found to cut light more than they reduce heat. Yes, shades are considered an important architectural detail. The AIA’s vision statement says it all: “Through a culture of innovation, The American Institute of Architects empowers its members and inspires creation of a better built environment." 3. All Polar Shades sales representatives are certified Somfy experts. Our partner, Somfy, is the leading provider of home automation products for shades. The company embraces cutting-edge technology, and their app allows you to operate your window coverings with your favorite device – whether you’re at home or on the road. As Somfy certified experts, we receive continuous training so we’re able to specify the best products for your home’s needs. Our goal is to make your selection, installation, and use of those products enjoyable and seamless. 4. We have computerized fabric cutting tables. We own the West Coast’s largest Gerber computerized fabric cutting tables, which enable us to make perfect square cuts for every shade. These amazing machines also allow us to cut multiple pieces of our beautiful, energy efficient fabrics at a time, making it possible to build hundreds of shades a day. 5. We are an authorized Phifer Fabrics distributor. Phifer exterior sun control products are American-made in Alabama and have been gracing homes and buildings since the 1970s. The broad range of fabrics are designed to absorb and dissipate up to 90% of the sun’s heat and glare, resulting in a more comfortable indoor temperature, better air conditioning efficiency, and ultimately, energy conservation. Like conventional fiberglass screening, all of Phifer’s sun control products guard against annoying insects. We hope you enjoyed learning these 5 fun facts about Polar Shades, but the #1 fact we’d really like you to know about our company is we appreciate and value our customers. If you’d like to learn more about us and the window covering products we offer, contact us today.